Juvenile rheumatoid arthritis (JRA), also known as juvenile idiopathic arthritis, is a disease of the joints in children. It can affect a child over a long period of time. JRA often starts before the child is 16 years old. In JRA, the joint becomes swollen. It will make the joint painful and difficult to move. JRA can also lead to long term damage to the joint. For some, JRA can interfere with the child's growth and development. JRA is caused by a problem of the immune system. The normal job of the immune system is to find and destroy items that should not be in the body, like viruses. With JRA, the immune system attacks the healthy tissue in the joint. It is not clear why this happens. The immune system problems may be caused by genetics and/or factors in the environment. Girls are more likely to get JRA than boys. Problems most often found in large joints. 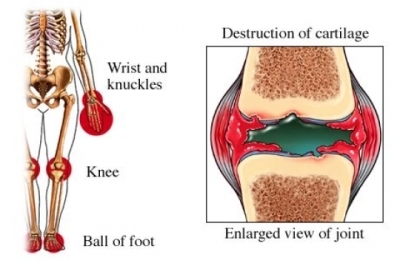 These joints include knees, ankles, wrists, and elbows. If the left-side joint is affected, then the right-side similar joint will not be affected. For example, if the right knee is affected, then the left knee will be healthy. Problems found most often in small joints of the fingers and hands. May also affect weight-bearing joints like the knees, hips, ankles, and feet. Joints on both sides of the body are affected. For example, if the left hand is affected, then the right hand will also be affected. May also have a blood disorder called anemia . This is an abnormally low number of red blood cells. Children with enthesitis arthritis often have tenderness over the joint where the pelvis and spine meet. Children with psoriatic arthritis often have finger or toe swelling. There may also be damage on fingernails. Often, there are remissions and flare-ups. Remission is a time when the symptoms improve or disappear. Flare-ups are times when symptoms become worse. You will be asked about your child’s symptoms. You will also be asked about your family medical history. A physical exam will be done. An eye examination may also be done to check for swelling in the eye. Your child may be referred to a specialist if JRA is suspected. The specialist is a doctor who focuses on diseases of the joints. Images may be taken of your child's bodily structures. This can be done with x-rays . Polyarticular JRA may become inactive in children who begin medications within 2 years of onset. Exercise is done to strengthen muscles and to help manage pain. Strong nearby muscles will support the joint. It also helps to recover the range of motion of the joints. Normal daily activities are encouraged. Non-contact sports and recreational activities may be good options. Physical activities can also help boost a child's confidence in their physical abilities. Physical therapy may be needed. This will help to make the muscles strong and keep the joints moving well. Splints and other devices may be recommended. They may be worn to keep bone and joint growth normal. Some joints may get stuck in a bent position. These devices can help prevent this. There is no known way to prevent JRA. Hofer MF, Mouy R, et al. Juvenile idiopathic arthritides evaluated prospectively in a single center according to the Durban criteria. J Rheumatol. 2001. 28:1083. Juvenile idiopathic arthritis (JIA) enthesitis related. EBSCO DynaMed Plus website. Available at: http://www.dynamed.com/topics/dmp~AN~T506592/Juvenile-idiopathic-arthritis-JIA-enthesitis-related . Updated January 2, 2017. Accessed December 21, 2017. Juvenile idiopathic arthritis (JIA) oligoarticular. EBSCO DynaMed Plus website. Available at: http://www.dynamed.com/topics/dmp~AN~T114122/Juvenile-idiopathic-arthritis-JIA-oligoarticular . Updated May 24, 2017. Accessed December 21, 2017. Juvenile idiopathic arthritis (JIA) polyarticular. EBSCO DynaMed Plus website. Available at: http://www.dynamed.com/topics/dmp~AN~T116580/Juvenile-idiopathic-arthritis-JIA-polyarticular . Updated May 24, 2017. Accessed December 21, 2017. Juvenile idiopathic arthritis (JIA) systemic-onset. EBSCO DynaMed Plus website. Available at: http://www.dynamed.com/topics/dmp~AN~T115968/Juvenile-idiopathic-arthritis-JIA-systemic-onset . Updated January 2, 2017. Accessed December 21, 2017. JAMA Patient Page. Juvenile idiopathic arthritis. JAMA. 2005;294:1722. Petty RE, Southwood TR, et al. Revision of the proposed classification criteria for juvenile idiopathic arthritis: Durban, 1997. J Rheumatol.1998; 25:1991. 2/5/2013 DynaMed Plus Systematic Literature Surveillance http://www.dynamed.com/topics/dmp~AN~T115968/Juvenile-idiopathic-arthritis-JIA-systemic-onset : De Benedetti F, Brunner HI, Ruperto N, et al. Randomized trial of tocilizumab in systemic juvenile idiopathic arthritis. N Eng J Med. 2012;367(25):2385-95. 2/24/2014 DynaMed Plus Systematic Literature Surveillance http://www.dynamed.com/topics/dmp~AN~T115968/Juvenile-idiopathic-arthritis-JIA-systemic-onset : Limenis E, Grosbein HA, et al. The relationship between physical activity levels and pain in children with juvenile idiopathic arthritis. J Rheumatol. 2014 Feb;41(2):345-351. 9/2/2014 DynaMed Plus Systematic Literature Surveillance http://www.dynamed.com/topics/dmp~AN~T115968/Juvenile-idiopathic-arthritis-JIA-systemic-onset : Guzman J, Oen K, et al. The outcomes of juvenile idiopathic arthritis in children managed with contemporary treatments: results from the ReACCh-Out cohort. Ann Rheum Dis. 2014 May 19.